It really was phenomenal to see some 140 trailer boats and their crews get out of their comfort zone and head out wide off Waihau Bay during the middle of winter. Better still, they then proceeded to work together to find the fish and share in the resulting action. 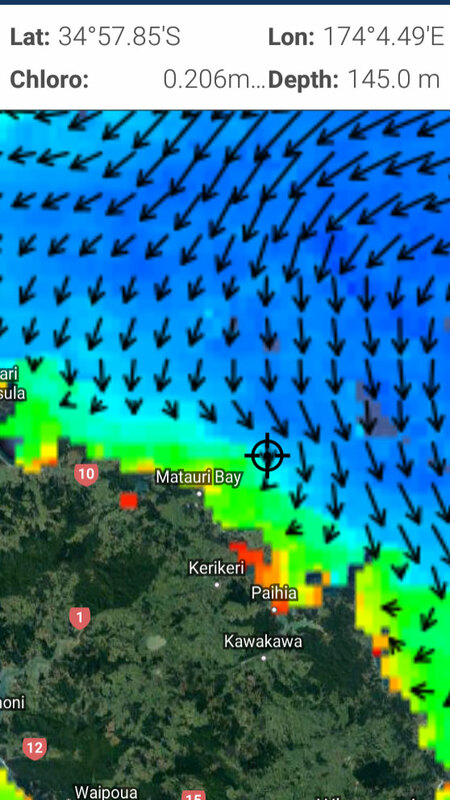 If you are like me and tuna fishing is your passion, sea surface temperature charts will be nothing new, helping to determine where the bigeye or southern bluefin tuna could be hanging out on the offshore knolls and seamounts off the North Island’s east coast. However, charts and overlays are also available for ocean currents, and to pinpoint current convergences, deep-water upwellings, temperature breaks, sea surface height, and chlorophyll levels. Many of these conditions move around New Zealand’s underwater hills and sea valleys in predictable ways. Tuna can be found throughout New Zealand’s waters year round, and several species are being targeted by the surface long-line fleet out there at the moment, such as albacore, bigeye tuna, Pacific bluefin, yellowfin and, to a lesser extent, skipjack tuna. Skipjack are predominantly taken by a purseseine fleet largely based out of Tauranga. Understanding the movements of tuna and correctly reading the signs are critical to whether a trip is successful or not. If not fortunate enough to know a charter-boat skipper or two willing to show you the ropes, this, and the following series of articles should help. I’ll try and keep these articles as simple as possible, but before I go into more detail, it’s important for readers to understand how commercial tuna skippers – such as my mate Tony ‘TK’ Walker – analyse and interpret various sea-surface temperature charts, and what they look for. It’s also worth keeping in mind that this information is not just good for tuna, it can help you find most big predators, including marlin and sharks, too. By understanding the charts, you’ll have an edge over other, less savvy, sport-fishing anglers. So, without any further ado, grab yourself a coffee and let’s have a chat about satellite imagery – the chlorophyll charts in particular, because chlorophyll is the start of the food chain. 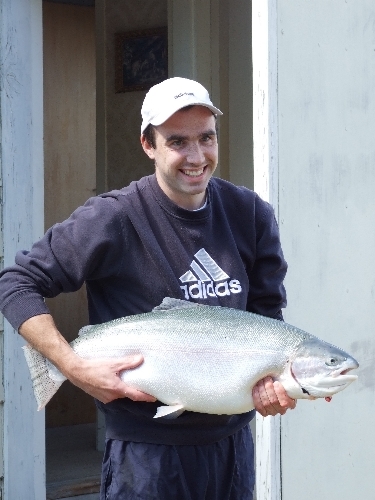 For many recreational sport-fishers, using satellite imagery to identify prime fishing locations is a bit of a mystery – but, in reality, it’s not that hard to interpret them, provided you have a basic understanding of what you’re looking at. Commercial tuna fishers throughout the Pacific, including here in New Zealand, already use chlorophyll charts to chase the albacore schools and bigeye tuna on both coasts of New Zealand during the summer, so it’s nothing new to us. (I suspect some of the top game boats here in New Zealand use them too, but they certainly keep very quiet about it.) With a little bit of practice and by looking at the various illustrations on the following pages, you too should be able to identify chlorophyll concentrations and thereby increase your chances of success out on the water. So, what is chlorophyll and what does it represent? In a nutshell, chlorophyll is the tiny green stuff found in plants, algae, and even inside our ocean’s tiny plankton. Plankton is the foundation of the ocean’s food chain and most baitfish eat it, including saury, flying fish, kahawai, trevally, jack mackerel and skipjack tuna – I’ve even seen albacore regurgitate the stuff on occasion. Consequently, by looking at chlorophyll charts, you are basically looking for plankton blooms in your fishing area – the start of the food chain. Consequently, if a bloom stays in an area for two or three days, there has been sufficient time for a food chain to develop, with the saury and various deepwater ‘uglies’ feeding on the plankton, the albacore and skipjack chasing the sauri, and even bigger fish, such as marlin, attacking the living snot out of the skipjack. By looking at the two charts nearby of the Far North from a day in November, you’ll be able to identify what chlorophyll looks like. 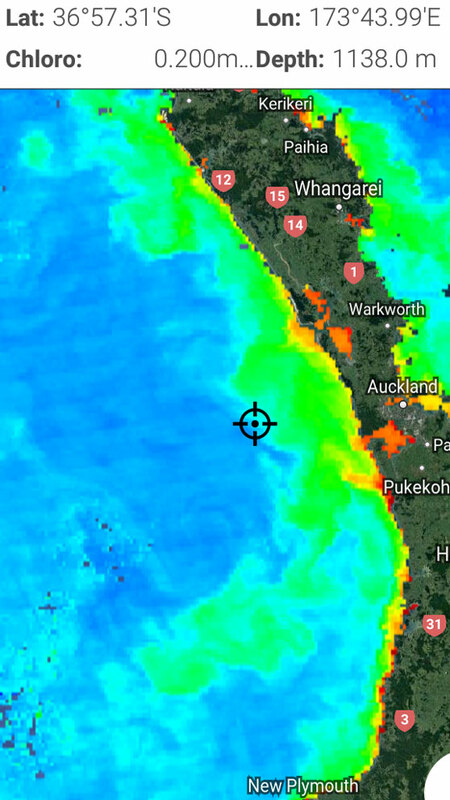 (I use FishTrack and the sea surface temperature charts to get the necessary information.) Areas of warmer, clearer water appear as blue, while areas of colder, nutrient-rich water appear as green, due to the higher concentrations of plankton. Where these areas of blue and green water meet, various baitfish, including squid, concentrate along the leading edges and remain there, providing the currents do not push the mixing zone out again. The FishTrack chlorophyll readings, read 200 and 204mg. (For those who don’t know, this reading is measured by plankton concentrations at milligrams per cubic metre.) When you look at where I have the cursor set, note that it is on the fringe of an area of bluer, clearer water. However, if the cursor was in the greener water, I would expect a higher level of chlorophyll/plankton in the realms of 0.55 milligrams per cubic metre. This is where the plankton bloom is located. In summer, the cleaner, bluer water you see out there is generally much lower in nutrients than may be found in the greencoloured water. So essentially the best combination of conditions for finding striped marlin off Cape Karikari (see adjacent chart, page 25) will be where the clearer, bluer water meets or mixes with water containing reasonable amounts of plankton (the green water indicated on the chart). Being highly temperature sensitive, tuna swim around trying to find the perfect combination involving two conditions: the first is current convergence, and the second is optimum water temperature. Yellowfin tuna prefer water temperatures of 19.5 degrees when arriving here in November; southern bluefin tuna prefer to hang out in cooler 15.6- to 16.4-degree water in July and August; and bigeye tuna, which have just arrived in the Far North fishery, seek water temperatures around 17-18 degrees. If you can match up your target species’ ideal water temperature with areas of current convergence, it can really help you find them; these are the highways the tuna travel along, as do mahimahi and marlin. So, what is current convergence and how do we identify it? A current convergence zone is basically an area where two opposing currents collide with one another, and generally involves one current flow that’s stronger than the other. 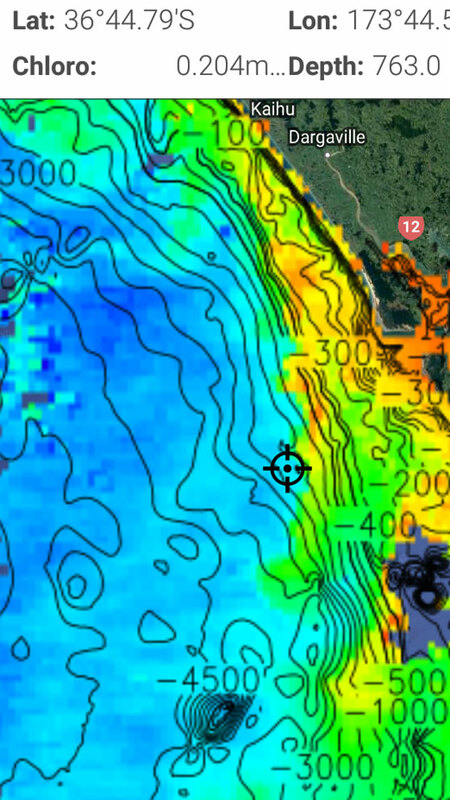 I use FishTrack’s range of current charts, updated daily, showing the currents and warm eddies at any particular fishing area; the longer the arrows, the stronger the current. Generally speaking, where these currents collide, the seas bank up to create current convergence zones – upwellings – between warm, low-salinity water and cooler high-salinity waters. At such places you’ll often get baitfish banked up on one side and predatory fish such as marlin and tuna on the other. The tuna typically swim along these areas, zig-zagging between either side of the convergences. In the illustration, I’ve used a recent Sea Surface Temperature chart of the Far North fishing grounds as an example of what to look for. 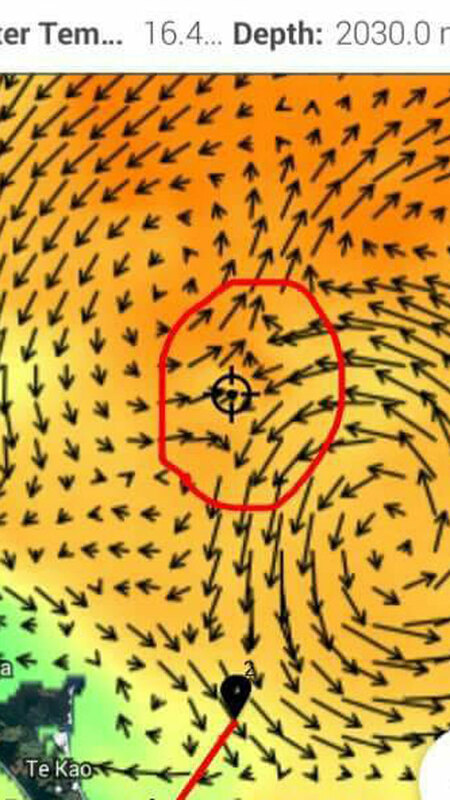 The current convergence is circled in red and the waypoint is in the general area of the popular Garden Patch off Houhora, with a strong north-west current pushing into its leading edge. The surface long-liners were catching bigeye tuna off Houhora and Great Barrier Island in late November, then tracked the fish south through Mercury Bay and the Western Bay of Plenty around the Ngatoro Knolls area in December as the gamefishing season commenced.